Artwork Panel: 28.3cm x 42.2cm ≈ 11" x 16½"
Silk/Brocade: 37.4cm x 104.9cm ≈ 14¾" x 41¼"
This depicts the Samurai Tokuda Sadaemon Yukitaka in a straw rain cloak tying the chin-strap of his wide straw hat. 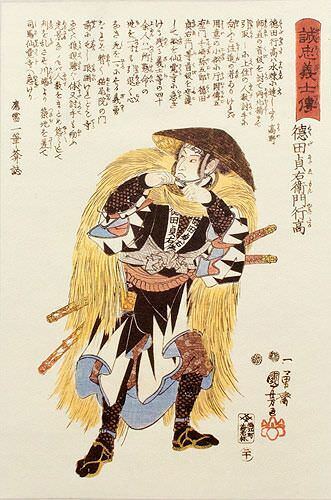 This artwork came from the series, Seichu gishi den 誠忠義士傳 (Biographies of Loyal and Righteous Samurai). This is a fine art giclee print reproduction of a very old Japanese woodblock print. This was made months ago, rather than centuries ago. Original woodblock was created in Japan, in the fall of 1853. Original Publisher: Ebiya Rinnosuke (海老屋林之助).